What is with all these zombie movies?? Is our culture really so morbid that we can’t get enough of seeing human bodies hacked to pieces? Zombieland (Dir. Ruben Fleischer) is only the latest in a veritable flood of ketchup-splattered, limb-laden flicks from the past few years in which humans are transformed into flesh-eating monsters and terrorize the few souls unaffected by the radiation, virus, or whatever. 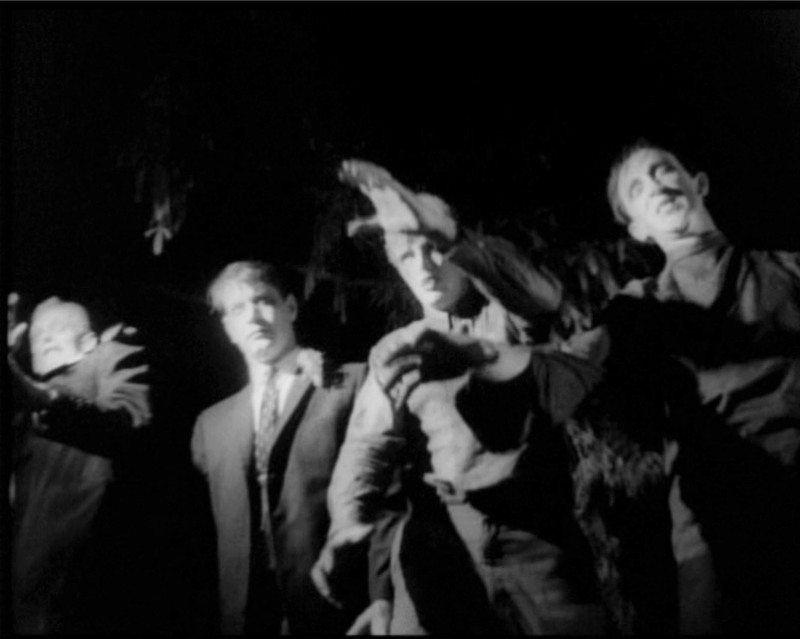 The zombie phenomenon began as a trickle in 1968, with Night of the Living Dead (Dir. George Romero), whose two sequels didn’t arrive until 1978 and 1985. 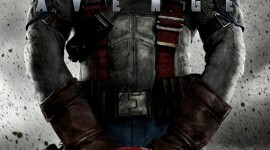 Those three movies were later re-made, however, along with new sequels City of the Dead and Land of the Dead. Add to that the Resident Evil series (Dir. Russell Mulcahy) and 28 Days Later and its sequel 28 Weeks Later (Dir. Danny Boyle), and it becomes clear that what once appeared to be a few strange but isolated incidents is now an epidemic sweeping the world. Indeed, a trip to the movie section at Wal-mart will turn up no end of little-known, low budget zombie flicks that never made it to theaters, each boasting its “gruesome” and “shocking” qualities. And now, we are soon to be hit with a remake of the Worst Movie Ever Made, Plan 9 fom Outer Space. Night of the Living Dead; the first zombie movie, and probably the best. The term “zombie” originated in Afro-Caribbean folklore, in which the dead could be revived by a “bokor” or sorcerer. By the 1950s, zombism (well, it’s a word now) was caused by radiation, just like everything else back then. More recently, zombism is usually caused by a virus, as in 28 Days or Zombieland. As the bard will tell you, all fiction eventually becomes a satire of itself. 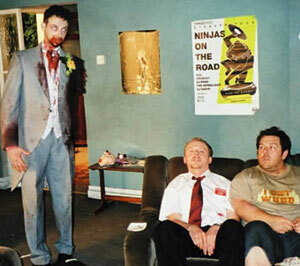 Such was the case in Edgar Wright’s Shaun of the Dead in 2004. Shaun is not the best of films, but nonetheless demonstrates a certain comedic brilliance in the way it backhands the zombie sub-genre. Our hero, Shaun (Simon Pegg), is staggering through his mediocre life, working the same dead end job, day after day, having problems with his girlfriend, etc. Which is why the trailer asks “do you ever feel like you’re turning into a zombie?” As luck would have it, Shaun’s world is overrun by real zombies. But even with a zombie apocalypse is in full swing, it takes Shaun a long time to notice that anything is amiss. One morning, he stumbles, half awake, across a street, past a burning car and a distant crowd of zombies into his neighborhood quick shop. He retrieves a beverage from a refrigerator inside, oblivious to the bloody handprints on the glass door, and proceeds to the counter, barely pausing when he slips in something all over the floor. Finding no one at the counter, he drops some money on it and heads for the door. As he’s leaving, the clerk, now a zombie, comes shambling out of the back room. Shaun yells “hey Eric, I left the money on the counter,” and leaves. Shaun: A hero must rise. From his sofa. 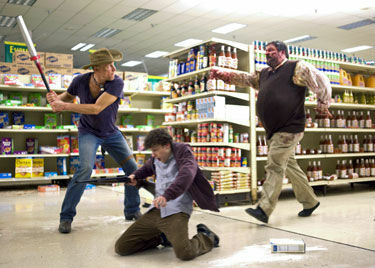 Shaun and his friends survive one scene by pretending to be zombies; something that Zombieland borrows. Perhaps uniquely among zombie movies, Shaun ends with the crisis actually being solved by the authorities – and the zombies being employed in the service industry. The final scene is of Shaun playing video games with his roommate, who is now a zombie and chained to the wall, lest he take a bite out of Shaun. The point of it all being: If the recently dead did reanimate and seek to feast on human flesh, things really wouldn’t be that different from the way they are now. But is that such a fresh message? Zombie stories always implied that civilization was inherently fragile and left us wondering if humans were that different from zombies. Dawn of the Dead takes place in a shopping mall, after all. Heck, zombie fiction was probably spawned by the breakdown of societal relations. Zombieland is definitely more comedy than horror. It’s not even scary, unless you count the occasional cheap shock (industry term for when something jumps out at you). I laughed pretty hard, though. It’s hard to believe a movie that goes through so many drums of corn syrup could be this lighthearted. The main part of the action kicks off in Garland, Texas (“it might look like zombies destroyed it, but that’s just Garland”), where we meet our narrator (Jesse Eisenberg), who identifies himself only as “Columbus,” the city he’s from. He explains his rules for surviving Z-land, which are superimposed on the screen as amusing graphics. He then has a chance to demonstrate them in an encounter with three zombies (below). Columbus practics Rule 3: Beware of bathrooms; only one way out. Zombie kill of the week? Z-land diverges from from most of the sub-genre however, because amid all the gore, what it’s really about is the forming, not the destroying, of relationships. After risking his life to save Witchita’s, Columbus concludes “In Zombieland, if you don’t have somebody, you might as well be a zombie.” It’s an odd feeling as the credits roll, and you suddenly realize that what you just saw was actually a feel-good movie. This flick has some genuinely fun moments, including one of the cleverest cameos I have ever seen, and a climactic scene in which Tallahassee runs through an amusement park with a huge arsenal, doing what he does best. All this, of course, is set amidst a giant playground of unlocked doors and all manner of goods and material comforts, abandoned by man kind. Maybe that’s what it is about all these zombie movies: the thrill of having everyone else out of the way and the world at your fingertips. Plus there’s the allure of a fun war – no remorse about “killing” the enemy. I have yet to meet a reanimated corpse or virus-induced cannibal in real life, but I think with our materialism and violent tendencies, a zombie apocalypse would be the least of our worries. 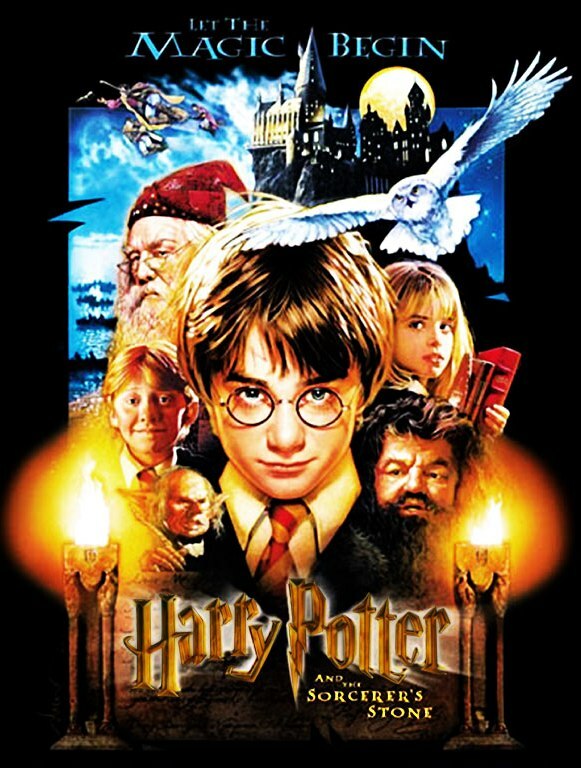 Have you seen this movie? Rate it! Images are property of their respective owners.